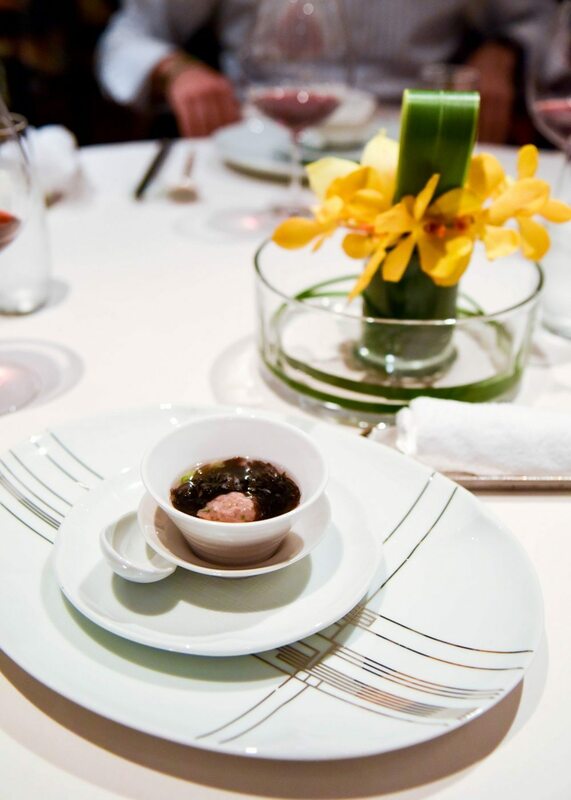 Lung King Heen is the first Chinese restaurant in the world to have been awarded the coveted Michelin 3-star rating and the only Chinese restaurant in Hong Kong to hold all 3; is ranked the 10th best restaurant in Asia and 20th best in the world, according to the respective Forbes 50 Best Lists. Lung King Heen, which translates as “View of the Dragon”, a name you’ll understand if you read my post showing you around Lamma Island, finds its home within the spectacular Four Seasons hotel, with breath-taking harbour views that are further accentuated by the elegant undulating silver-leaf ceiling designed to reflect Hong Kong’s glittering skyline and harbour lights, it is a stunning set-up in which to enjoy a meal. I have never experienced service like it. 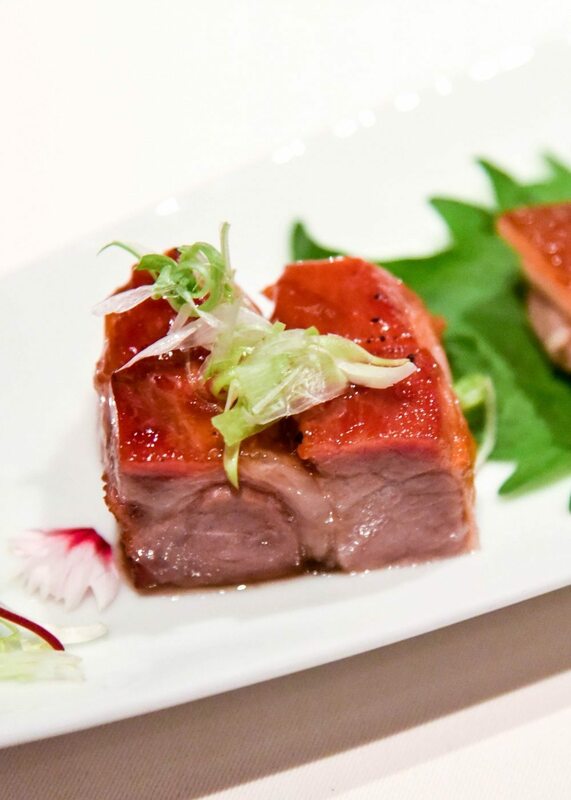 Though my fork experience at Ho Lee Fook comes close, the staff at Lung King Heen quite honestly exceeded any expectation I could possibly have had. Warm and personable, they were knowledgeable and perfectly attentive, by your side with the glance of an eye but not once intruding or having an overbearing presence. 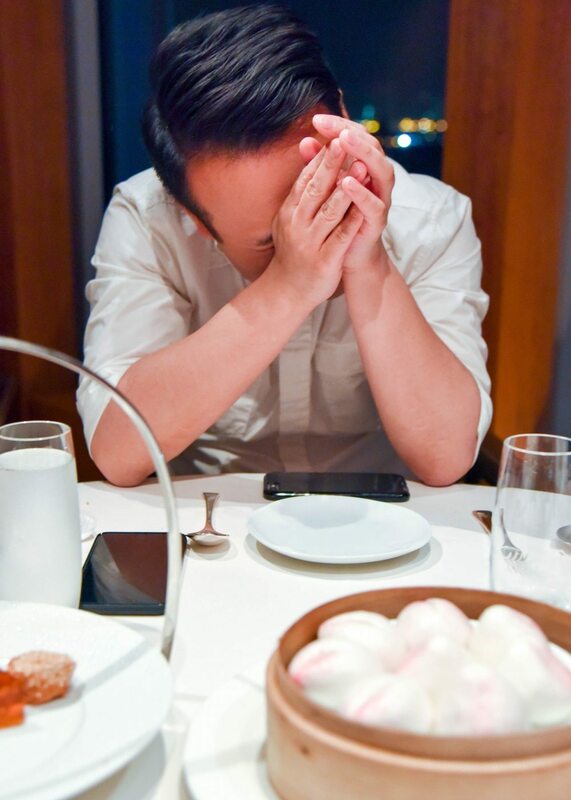 Needless to say I loved every second of it and can only continue to wish that half-decent restaurants would focus on service as much as their food. 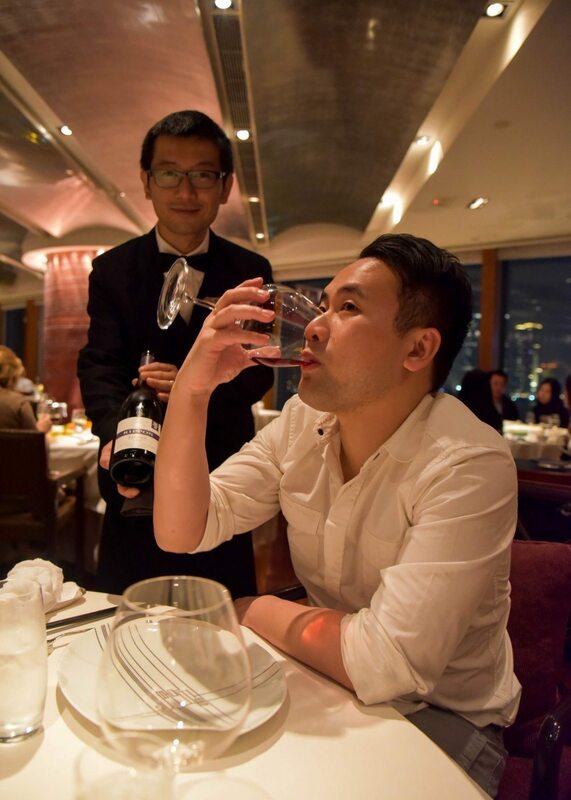 We enjoyed two bottles of excellent (and relatively reasonable) bottles of south New Zealand red wine with our meal ($800 a pop) (all prices in HKD $). 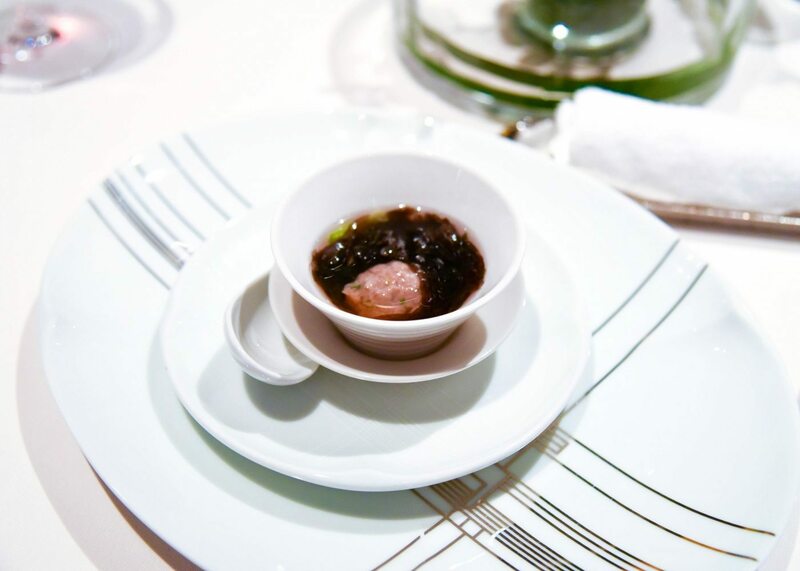 It wasn’t long before an amuse bouche of poached beef dumpling with coriander and seaweed in soup arrived and was set down upon our chargers (I’ve never seen so many plates for such a small amount of food), which was delicious. 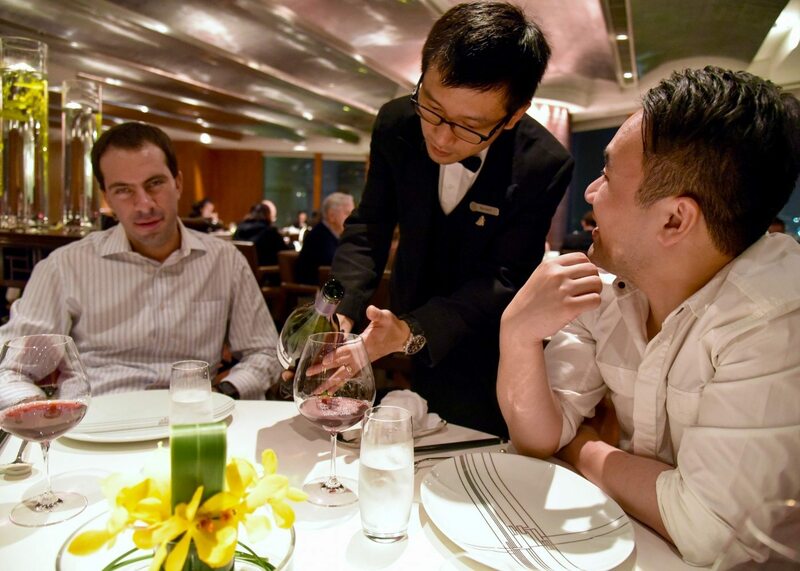 With such an expansive and appetising menu, choosing dishes was no easy feat. 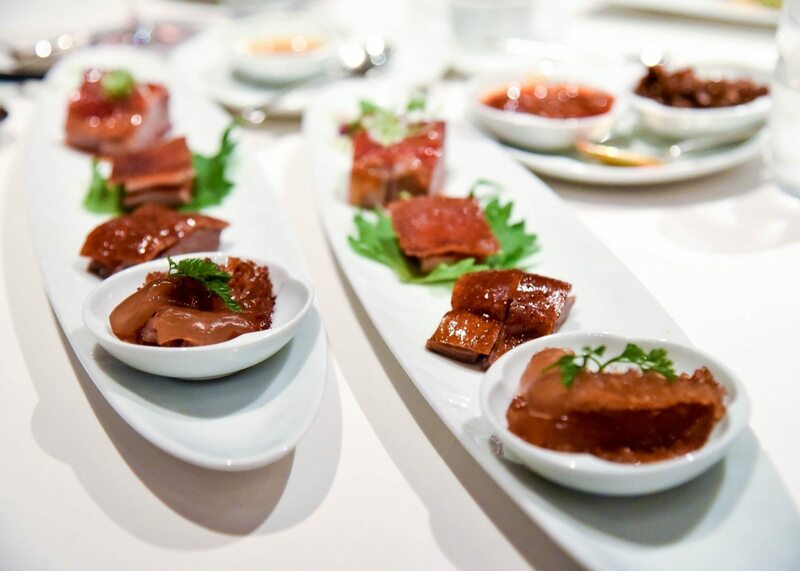 Bekky & I both opted for the Chef’s signature appetiser selection (4 varieties) ($260) to start, which offered two beautiful bite-sized pieces of each of (from left to right) barbecued pork with honey sauce, crispy suckling pork, roasted goose with plum sauce and marinated jellyfish. As a Dane I love all things piggy (quite fitting really), so it was no surprise that my favourites were the two pork varieties. 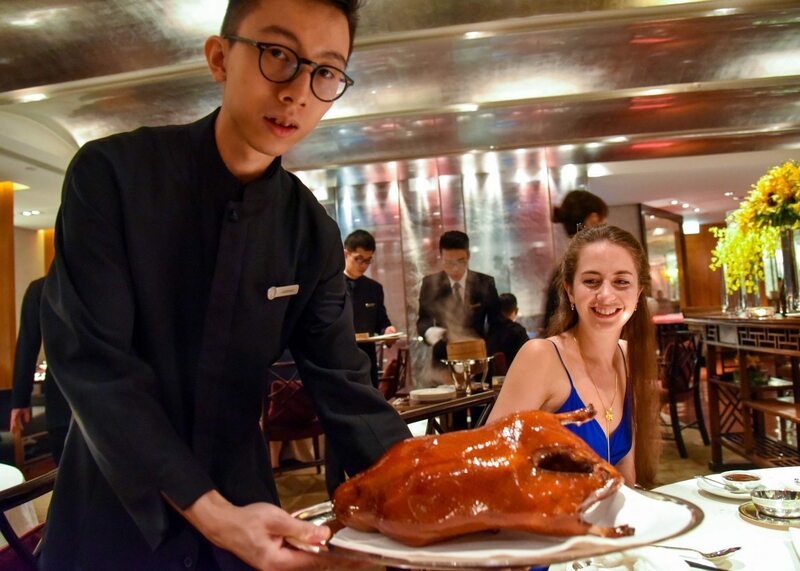 That’s not to say that the goose wasn’t superb however, as it was truly melt-in-the-mouth perfection. 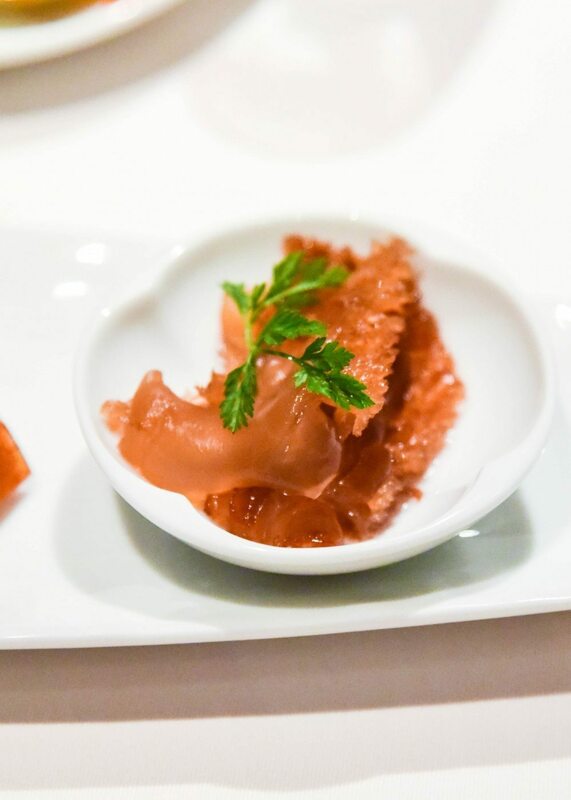 I must admit that I could have passed on the jellyfish: the rubbery, chewy texture felt out of place amongst its fattier, meaty friends. 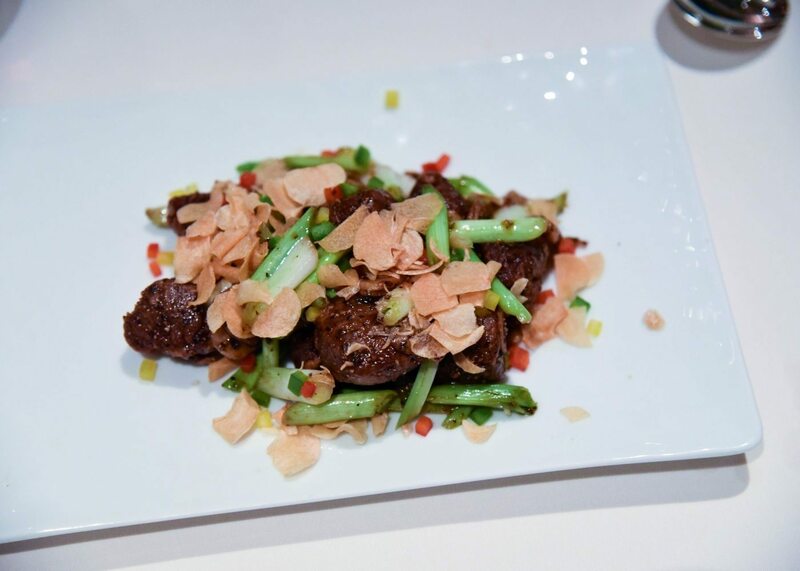 As for the boys, with Eric being a kosher Jew and thus pork and shellfish being off the menu for him, they opted to share the wok-fried Australian beef tenderloin with spring onion, garlic and black pepper ($480) as a starter. The meat was exceptionally tender and flavoursome. 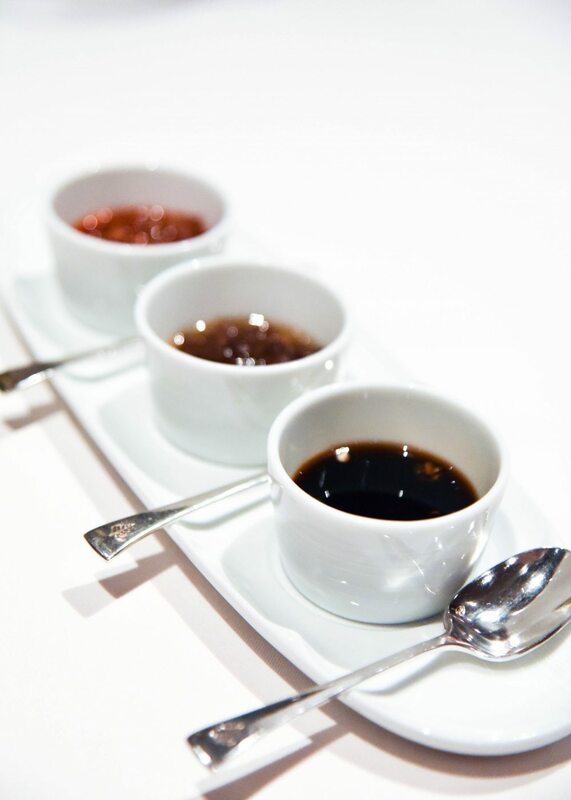 And lest not forget the condiments. My God. 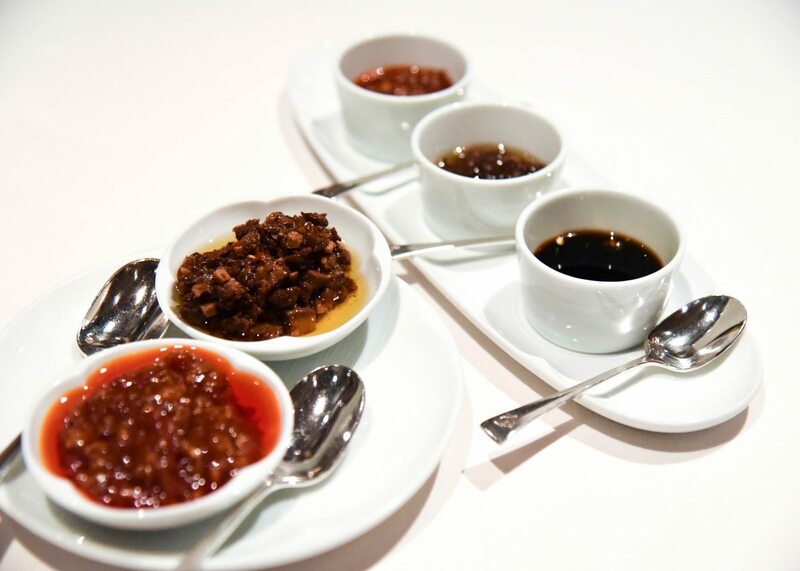 The condiments. 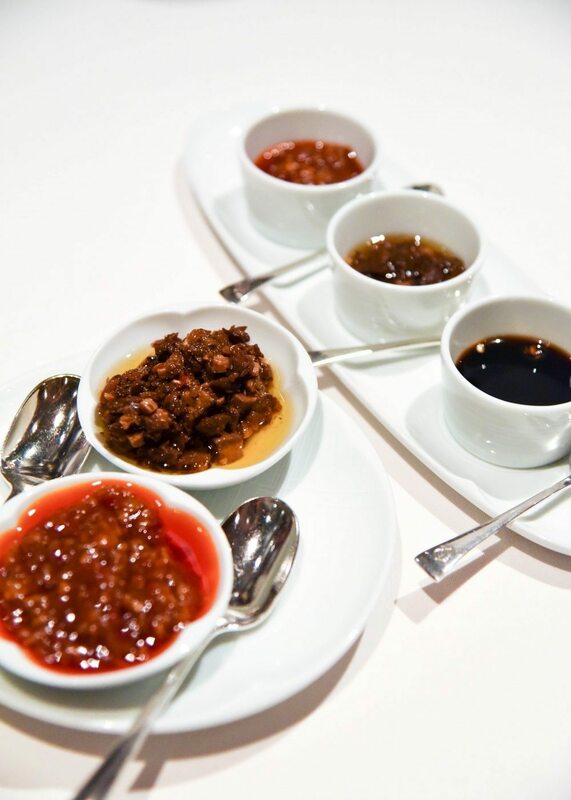 Renowned for its award-winning XO sauce, it’s fair to say that a few of us (read: me) demolished this, as well as an exceptional vegetarian alternative (since XO sauce contains both shellfish and pork) that uses a mushroom base and is rich with umami flavour, at an alarming rate. I’m not even ashamed to say that I ate them both straight off the spoon. *Think Chinese equivalent to peanut butter, aka crack*. 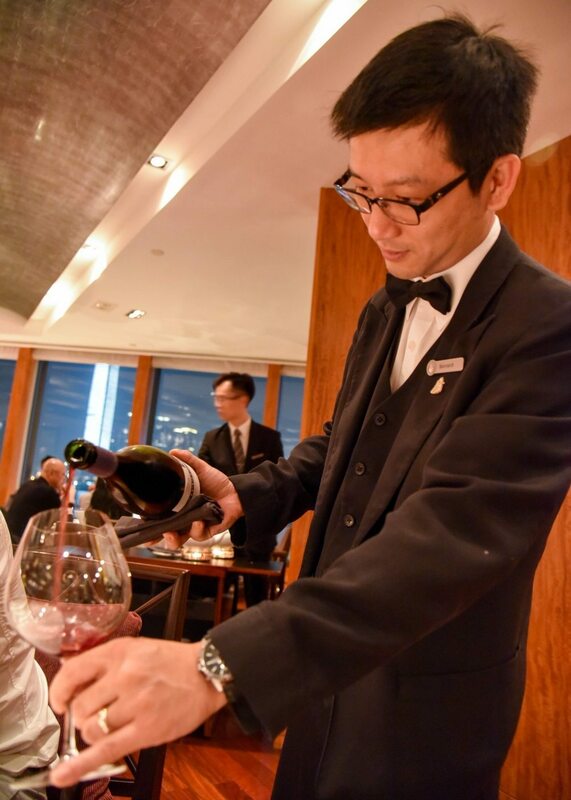 Thankfully the beauty of dining at a 3-Michelin starred restaurant is that top-ups arrive imminently (and for free), a welcomed change to my having to persistently request “MORE SAUCE PLEASE” like an admittedly more fortunate but equally as desperate Oliver. 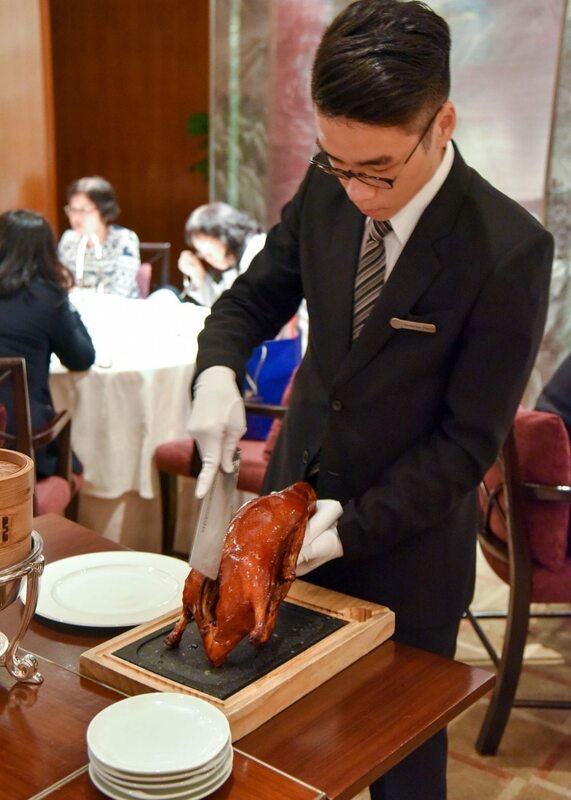 Then it was time for the pièce de résistance, the dish that we all came for, the roast Peking duck with two courses (that you must order 24 hours in advance to secure) ($880). 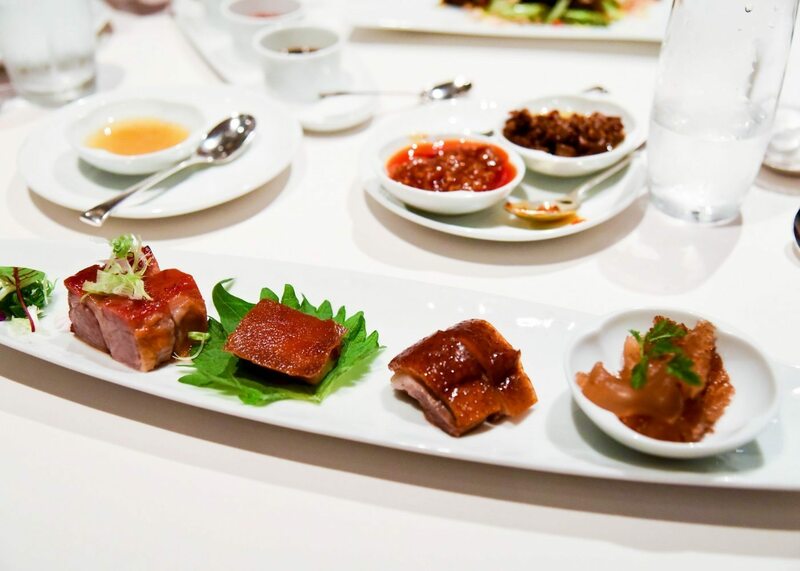 You can choose for the duck to be served in a number of ways; atop the most delicate yet freshly doughy pancakes with all the usual trimmings, shredded and combined into special fried rice or noodles, or a lighter option of minced and served in lettuce cups. 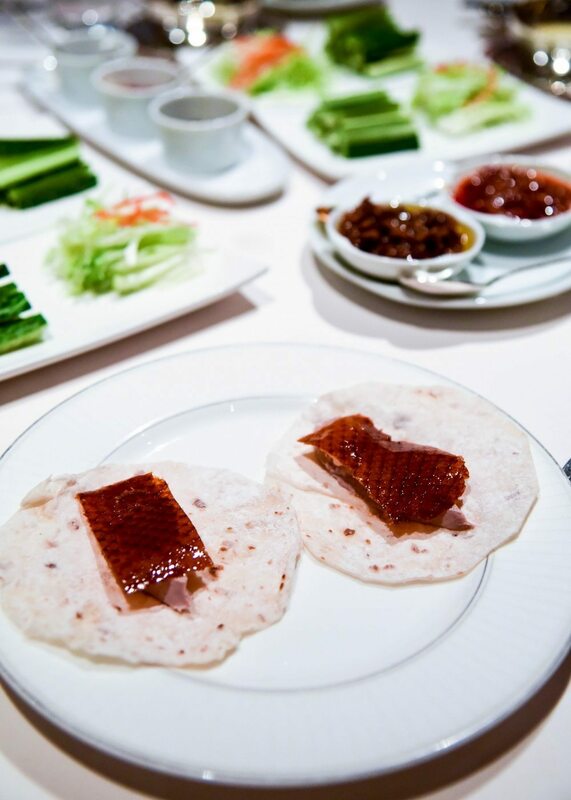 Naturally we stuck with our roots and opted for the nation’s (England, that is) favourites of Peking duck pancakes and for the rest of the bird to be incorporated into a special fried rice like no other. 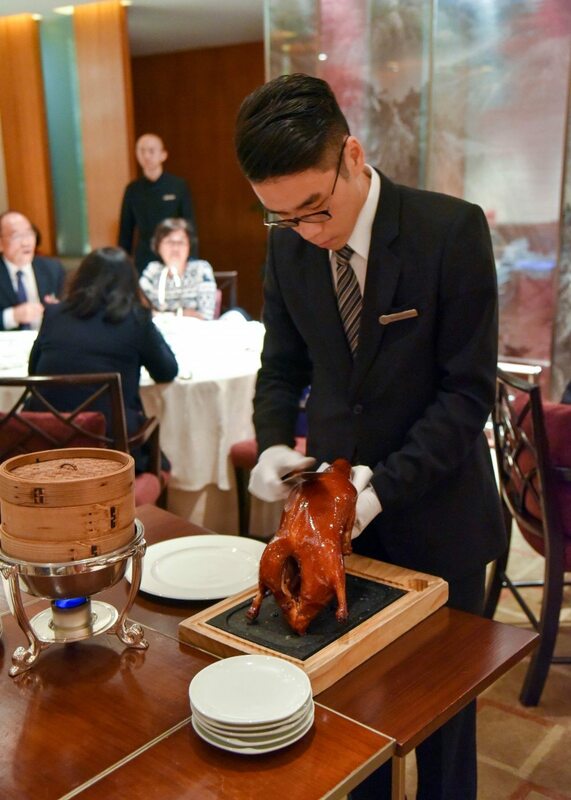 In contrast to its solid competitive contender, the roast duck at Lung King Heen is prepared very differently to that of Hutong, with the bird served with the most mesmerising glossy skin, which after being presented to you whole for salivation purposes is expertly carved before your eyes, with the skin skillfully separated from the meat of the bird. 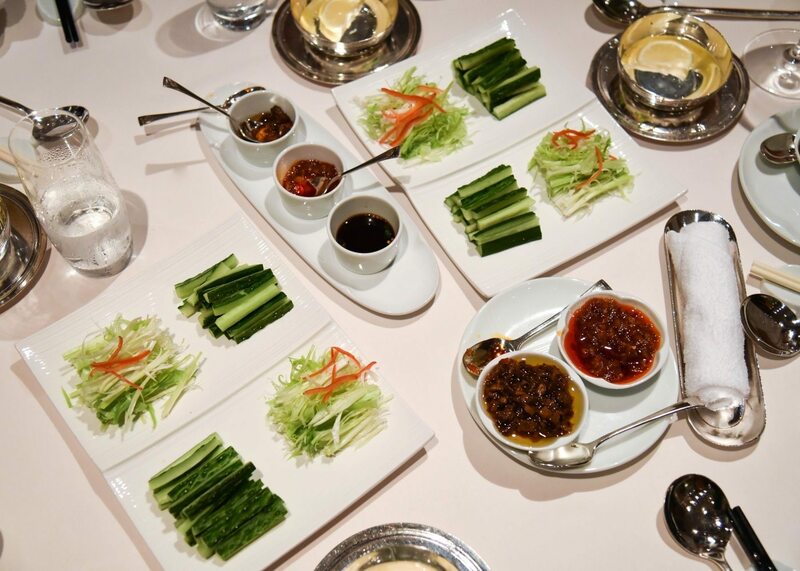 A table brimming with condiments is one sure way to set my heart on fire and it’s safe to say that Lung King Heen’s interpretation of my request for extra cucumber and plum sauce did not disappoint. 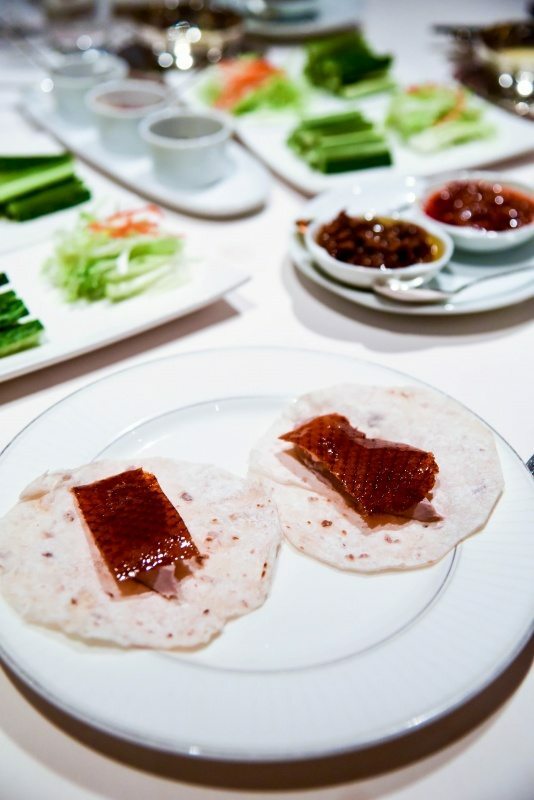 Unsurprisngly, the duck-filled pancakes were excellent. Faultless, in fact. 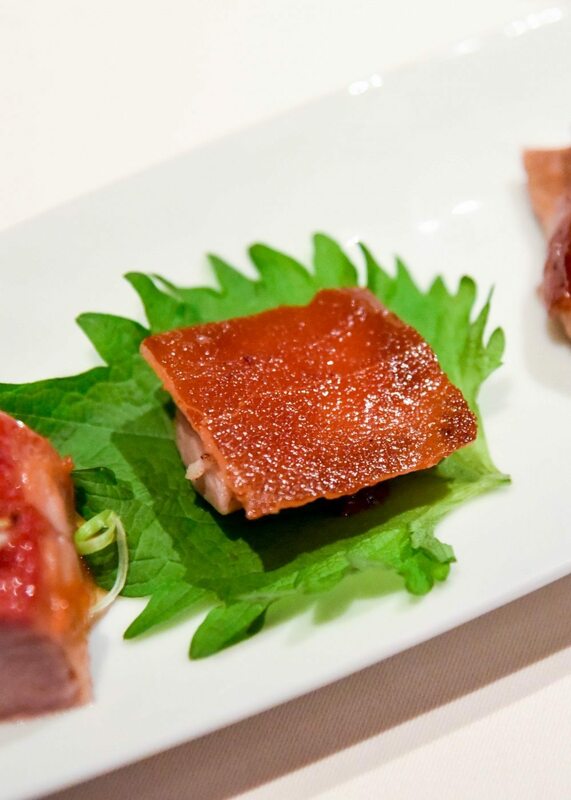 The meat was juicy and the skin wafer-thin and essentially candied. 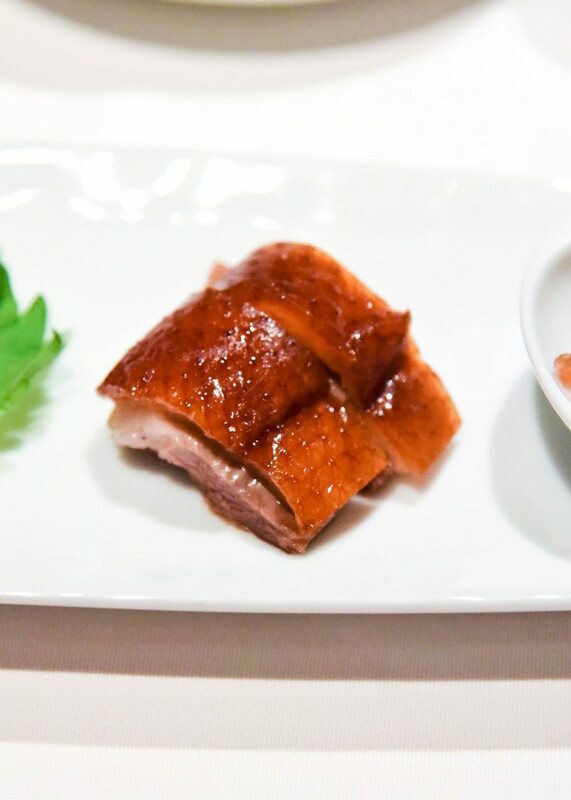 I had high expectations for the duck which were plainly met. What took me aback were the pancakes. 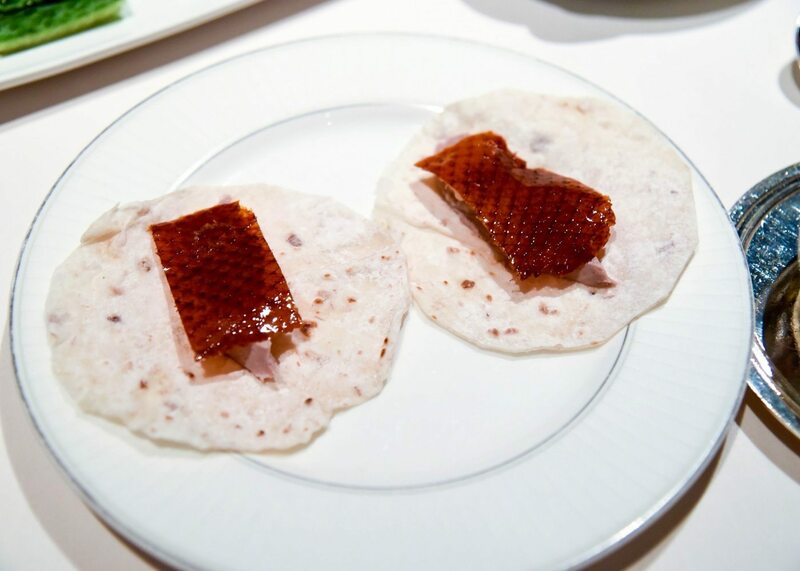 I know, who would have thought it, but seriously, game changing in the realm of Peking duck pancakes. I’m not sure I will ever be able to enjoy less than 3-Michelin starred pancakes ever again. They were a pillowy dream. Overall? 10/10. Exceptional. Amazing. Incredible. Insurpassable. 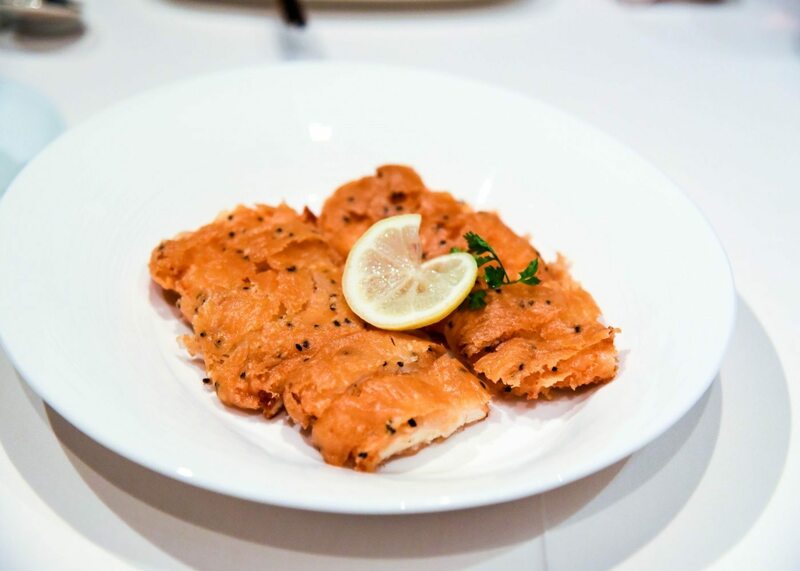 Whatever adjective you can think of, this dish was it. 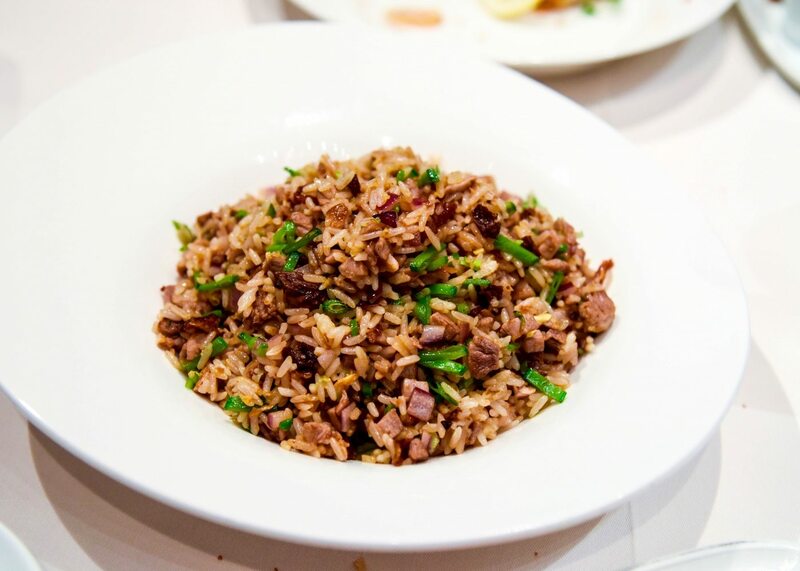 Part 2 of our decadent duck arrived intermingled amongst some seriously next level fried rice. Moist. Flavoursome. Delicious. Yes, yes, yes. We enjoyed it alongside orders of another English staple, crispy chicken fillet with sesame in lemon sauce ($260), as well as stir-fried shredded vegetables with bean sprouts ($200) (gotta get those 5-a-day) and a random but highly recommended order of the crispy taro dumplings stuffed with vegetables and mayonnaise (4 pieces) ($260). The “lemon chicken” was yummy, and though I might shamefully have to admit to being ever so slightly disappointed by the lack of fluorescent yellow gloop that normally accompanies it, the poshed-up poured version was a decent alternative. 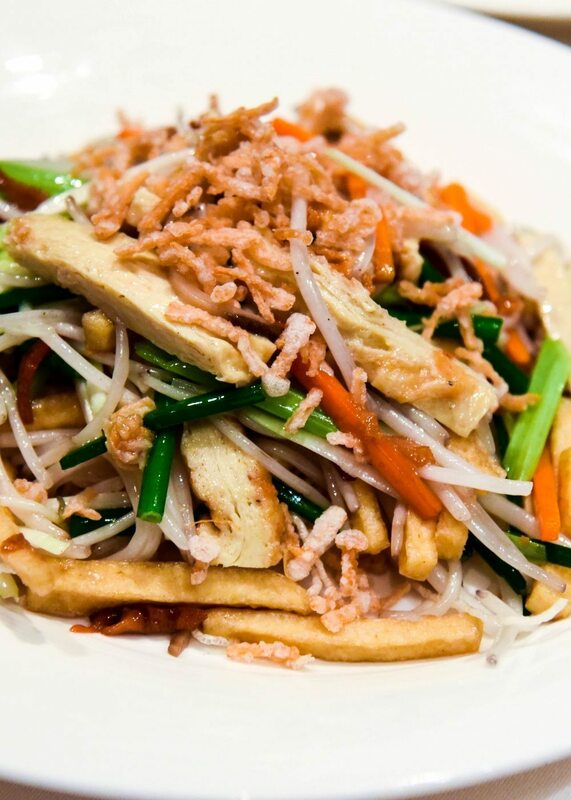 The veg was a good veg, plenty of variety and a good-sized portion. The taro dumplings were interesting. Crispy & creamy they were a skilled combination of textures and were unlike anything I’ve had before, so in that sense were a triumph, though they were rather light on flavour. 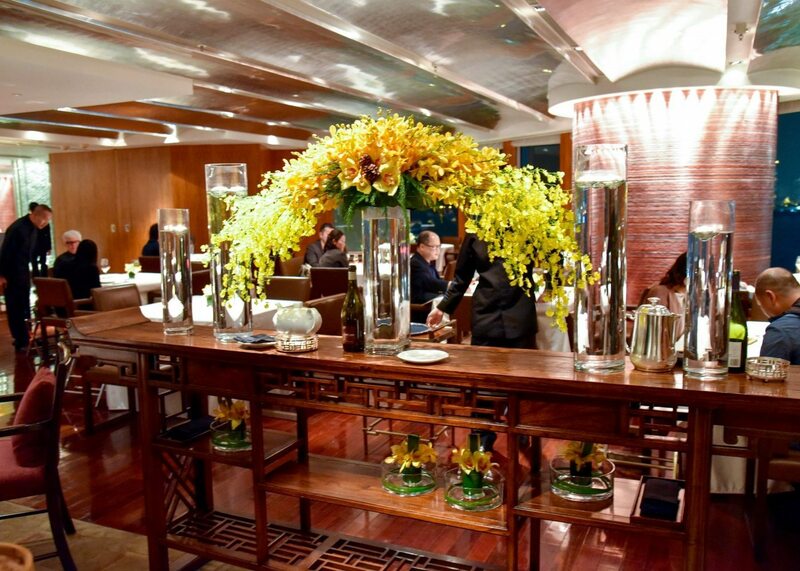 Being entirely satisfied and Chinese desserts never really appealing to me, we asked for the bill. 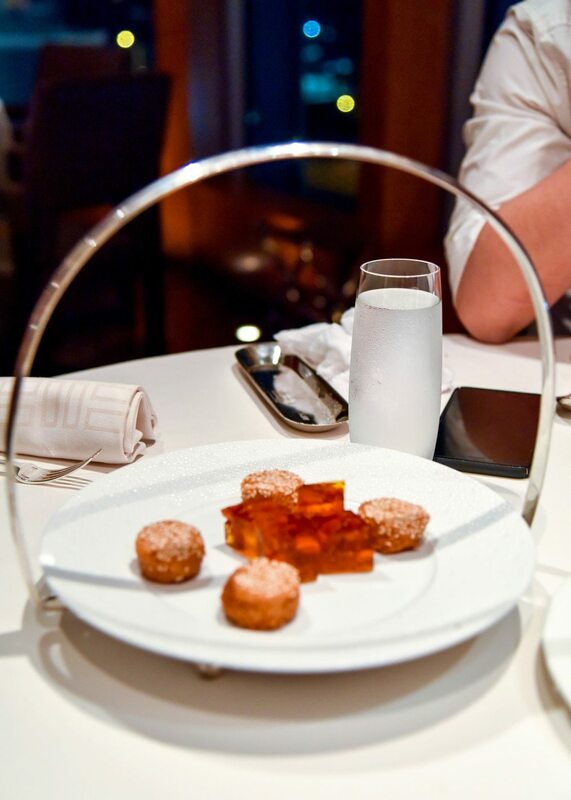 However, we all know that when a free dessert arrives, a free dessert must be devoured. 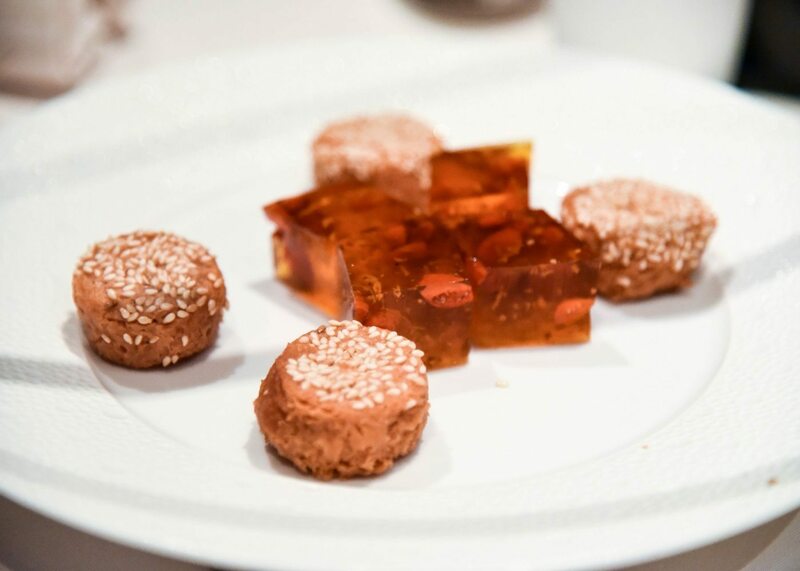 We were grateful to be served a generous selection of three different kinds of dessert; steamed longevity buns with lotus seed paste and egg yolk ($66); chilled Osmanthus pudding with Qi Zi herbs ($66); and baked fermented bean curd puffs with lotus seed paste ($66). 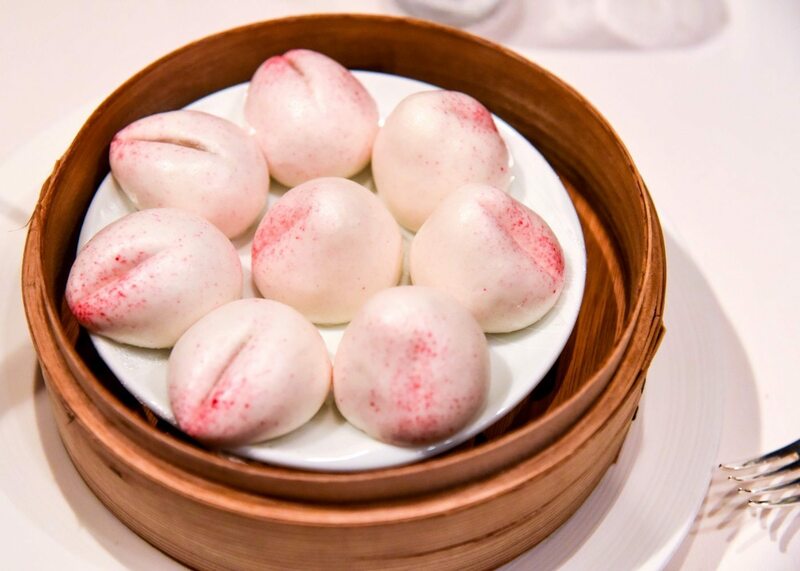 The jelly-like cubes weren’t for me but I really enjoyed the steamed longevity buns, though a little on the heavy-side post our indulgent meal they were fluffy and their filling tasty, with the fermented bean curd puffs a yummy biscuity note to finish on. 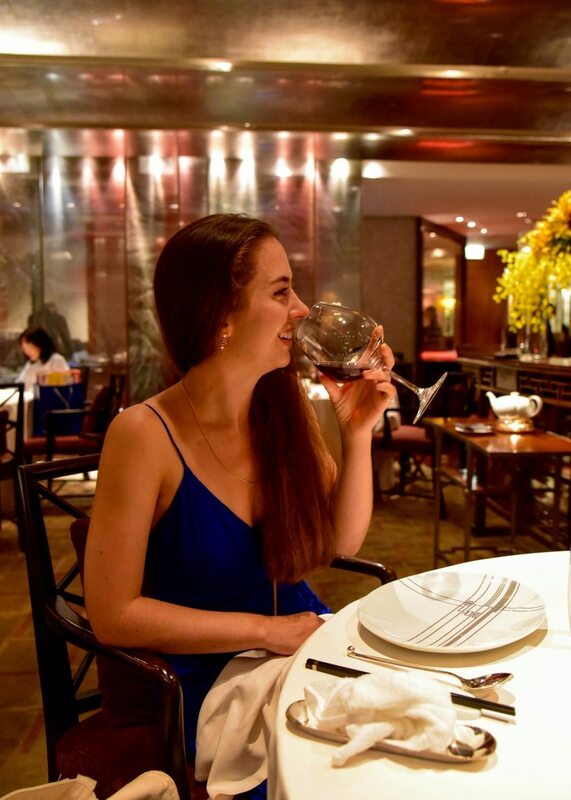 We practically had to roll ourselves out of the restaurant but not without huge smiles plastered across our faces. ^ Case in point. 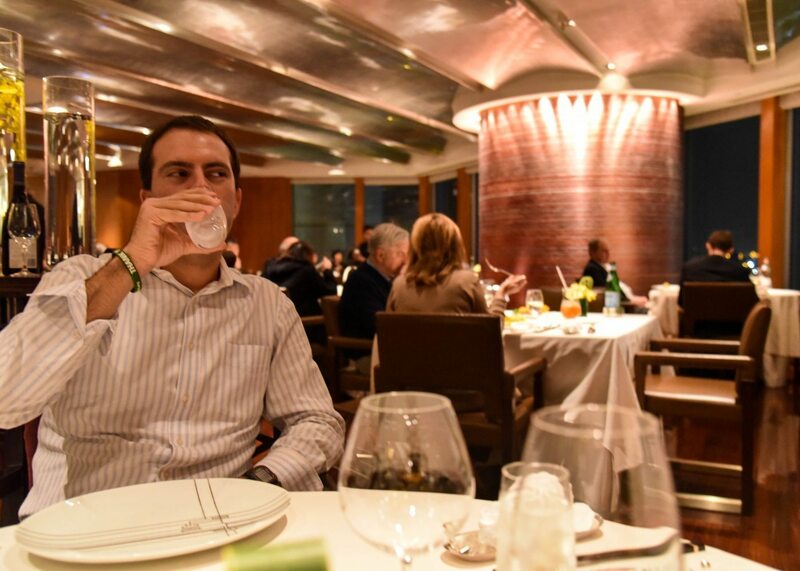 It was my first 3-Michelin starred experience and what a truly fabulous and memorable one it was. 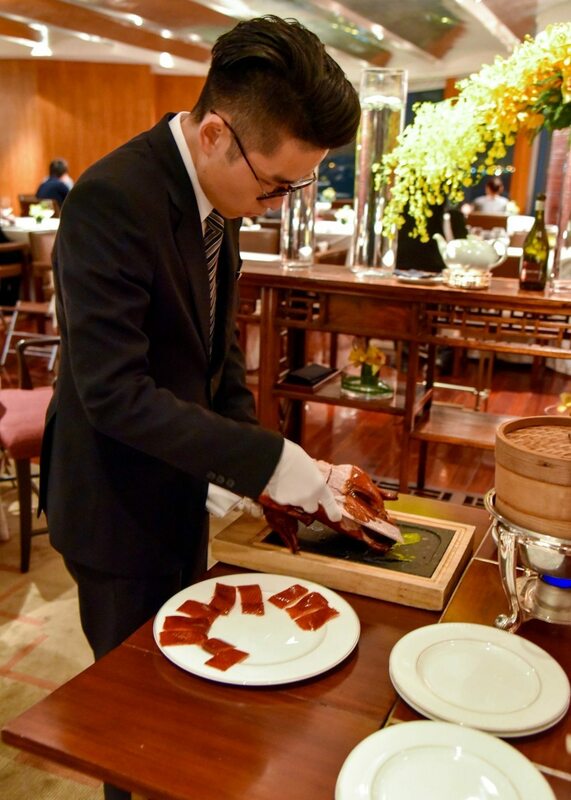 With Chinese food being far from my favourite I can honestly say that every dish we ordered was a delight in its own right, and the Peking duck was something of pure magic (hats off to Executive Chef Chan Yan Tak). The service, the setting, the execution and flavour of the food was simply outstanding and comes highly recommended by me. I would advise booking far in advance, particularly if you would like a window table, and going with a hungry belly. 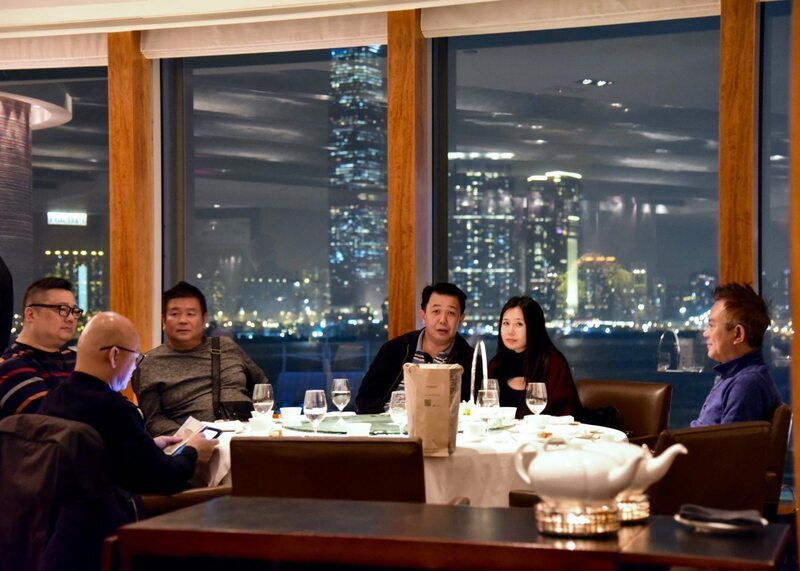 The prices vary immensely and having borne that in mind whilst ordering we were all pleasantly surprised and more than happy to pay only $1,138 (£120) each for our meal, including wine, which I think is fairly unheard of for a Michelin-starred meal let alone one with 3*s! 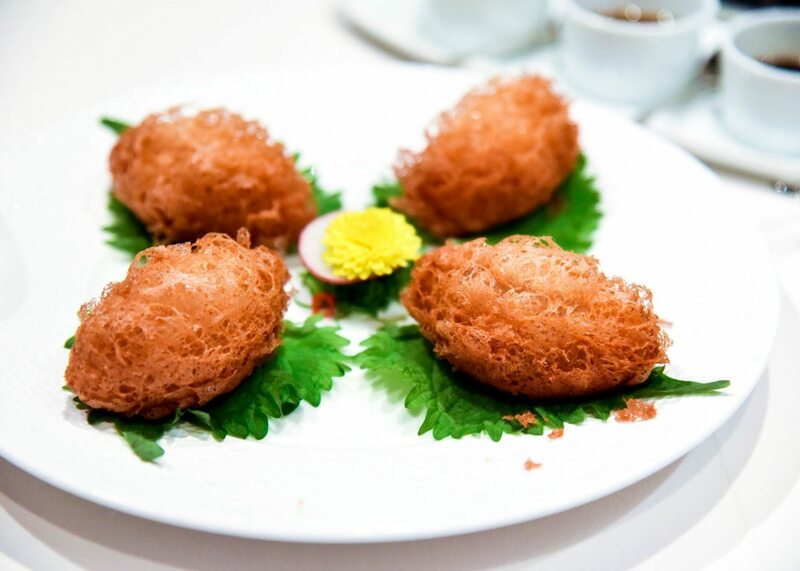 I should also add that Lung King Heen offers dim sum set menus at lunch both during the week and at weekends, should you wish for something even more wallet-friendly or to sample their famed dim sum. OMG!!!!!!!!! LOVE!! I’m so glad that you went! You even had the same waiter as us! He was lovely, and helped with the pictures cos his family was into photography. 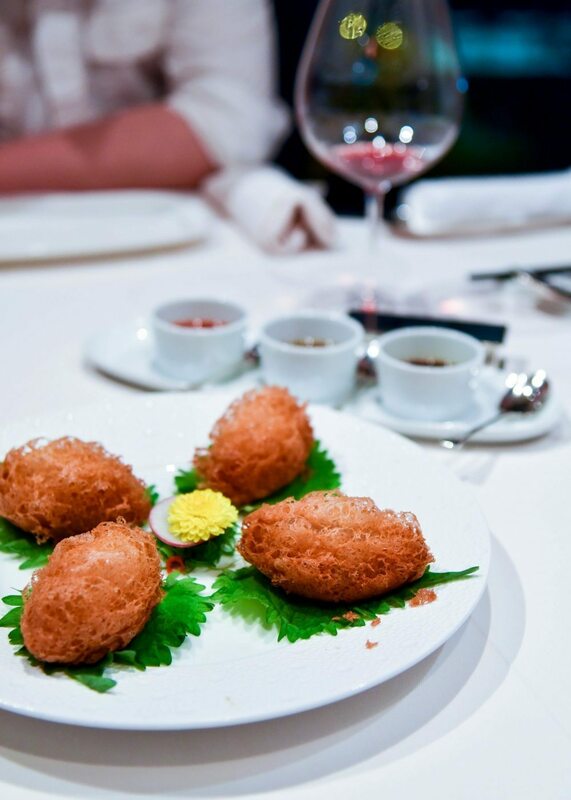 I’ve never been to China or Korea but there’s a few starry Japanese restaurants on my blog. Your photos are so gorgeous, Andrea! 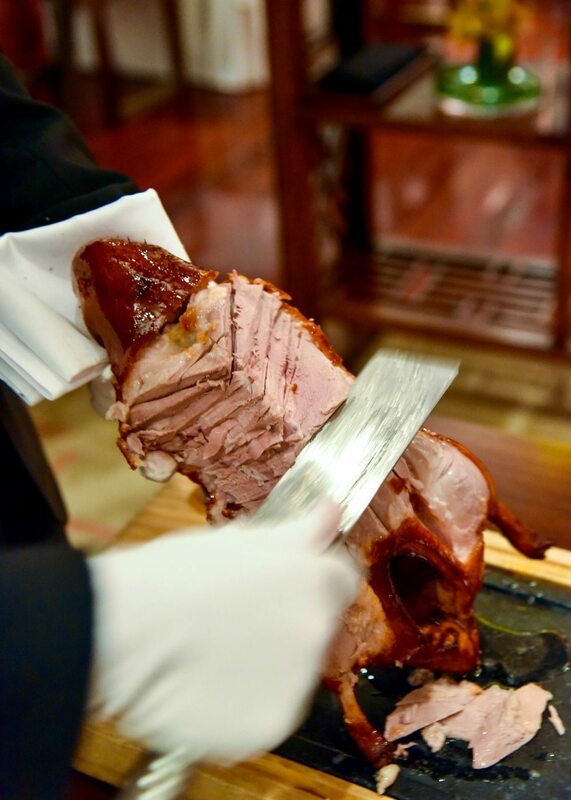 The Peking duck looked fantastic. 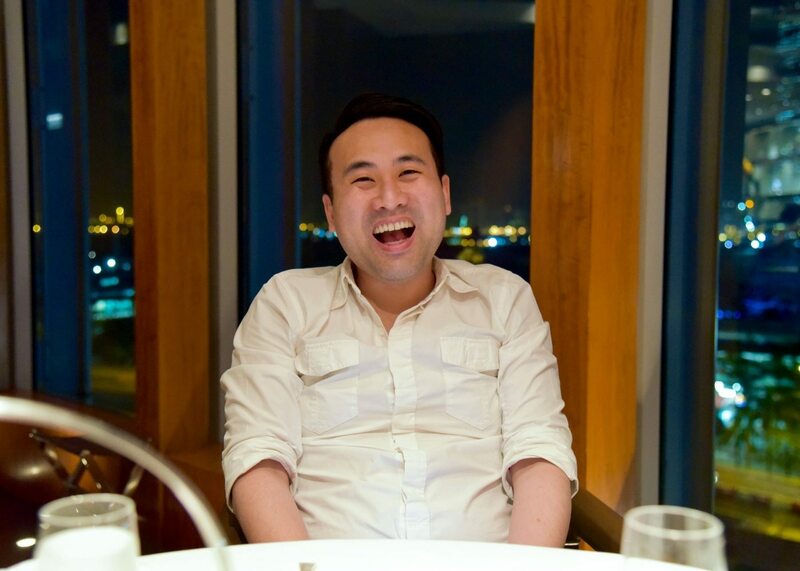 God I seriously miss proper Chinese food! 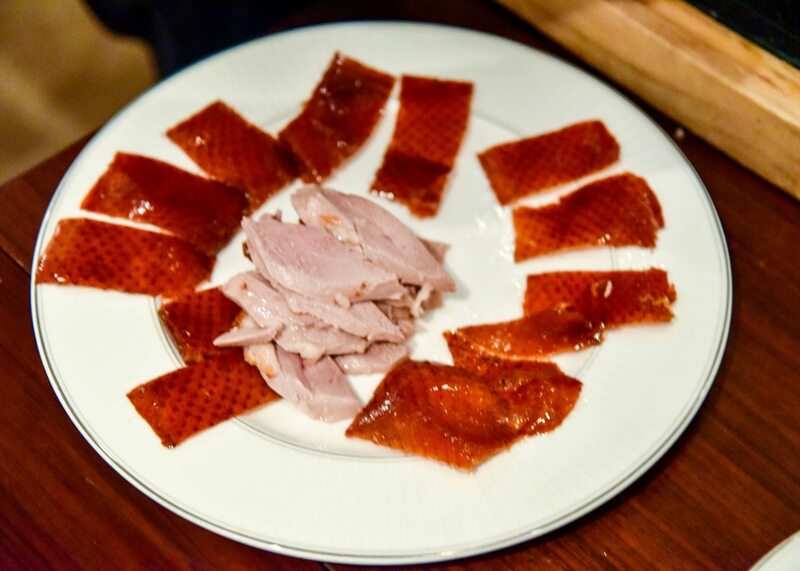 That duck skin looks so appetising and I feel like punching my fork through!!! Can’t wait! 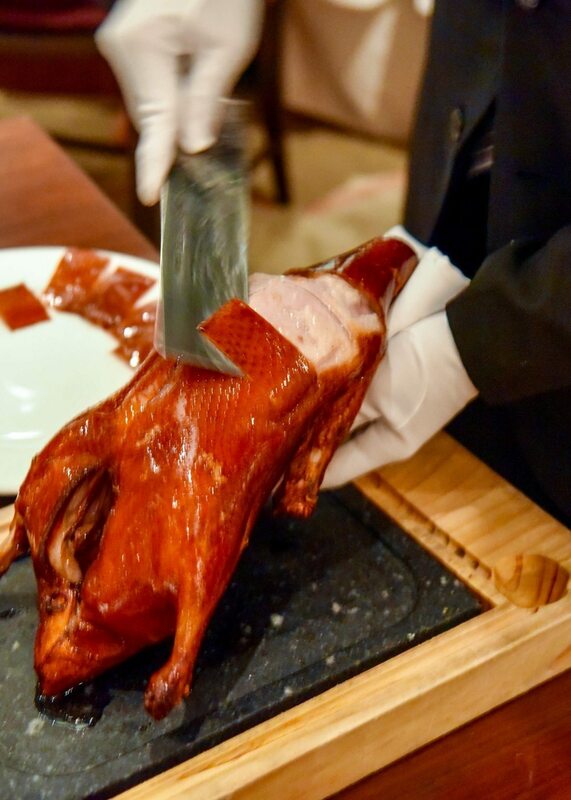 That Peking duck though!! All the food looks incredible! Made me feel hungry with all those food and your shots are awesome surely inviting me to visit this place.